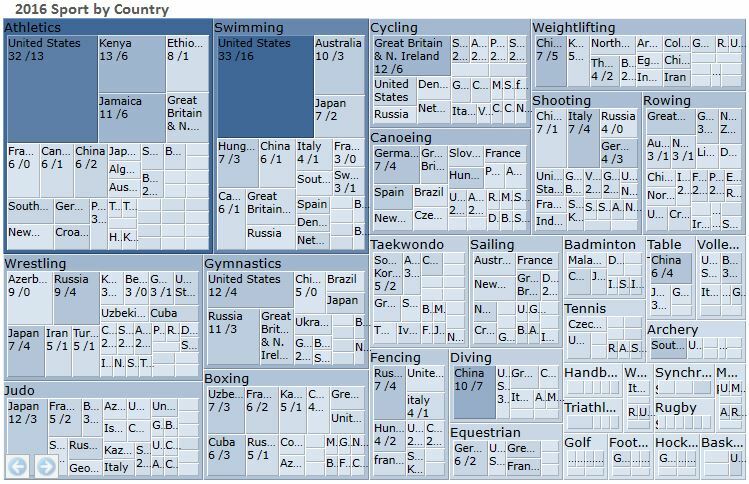 The charts are split by country, and then sport where the size of the tile represents total number of medals, and the colour saturation represents the number of Gold medals. We can see immediately that the US retains a significant lead over the other nations, and also that roughly half its medals overall were won in Swimming and Athletics. Great Britain and France have seen their relative medal positions strengthen in the four years. 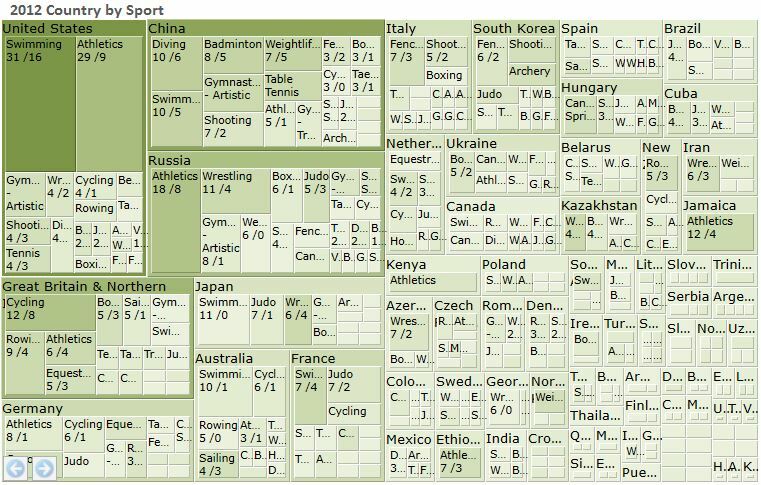 It’s difficult to see the breakdown for countries with smaller numbers of medals, but the interactive version can of course be drilled to additional detail and we’ll make that available in the coming weeks. 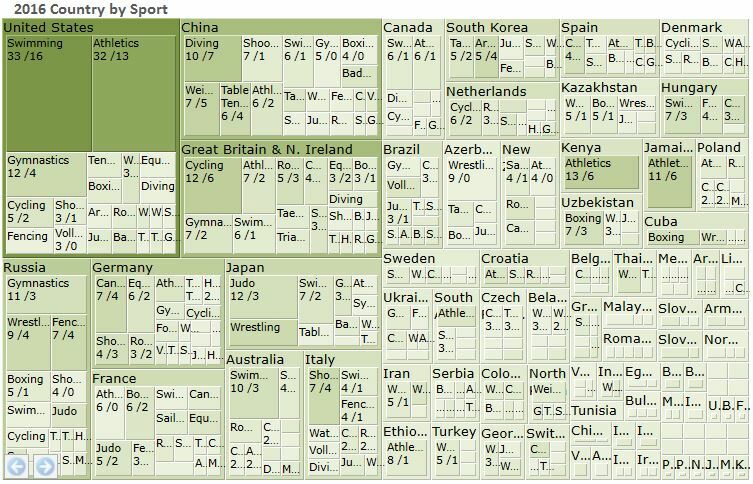 Athletics and swimming have the most events and hence the most medals and largest presence on the Treemap. 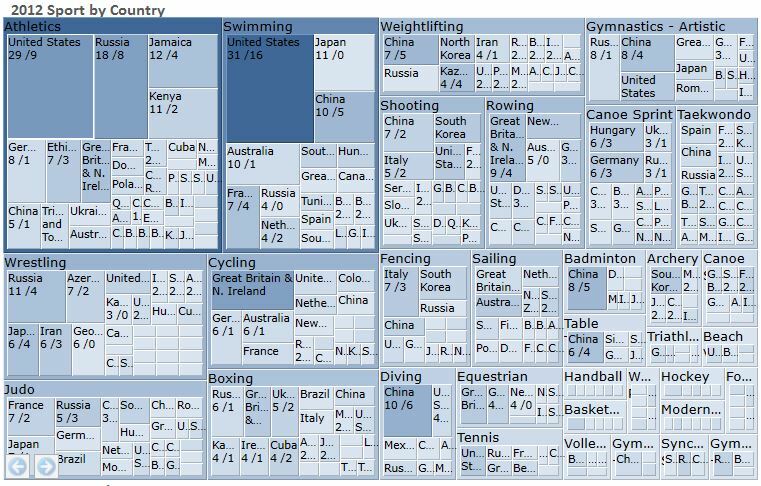 USA dominates both categories across both London and Rio, with an even stronger grip on athletics in Rio. Elsewhere China rule the diving boards, winning 7 of the 8 events in Rio. Team GB again did spectacularly well in Rio, and as a British company we can allow ourselves a slight bias in our coverage (a roundabout way of saying the remaining charts are just about the British team). 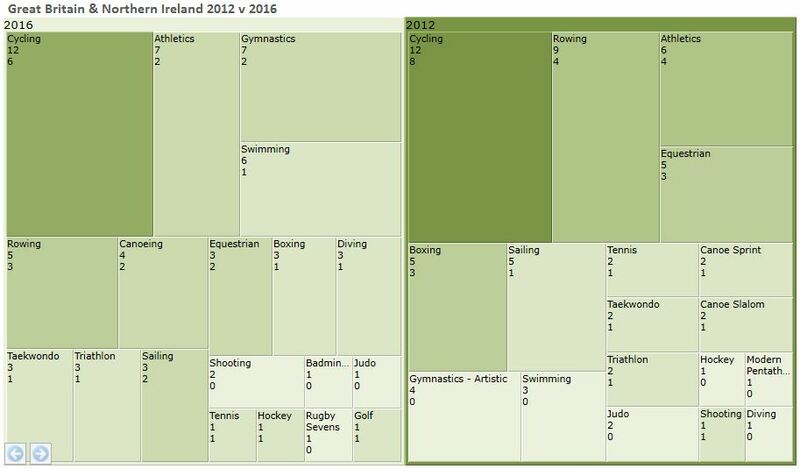 Firstly we’ve brought the 2012 and 2016 data for GB together into one treemap as shown below. While the mix of sports is slightly different, and in both games the team won medals across 19 sports, the core strengths remain fairly consistent. Despite that, there are some interesting movements. Gymnastics and swimming have shown the biggest improvements between 2012 and 2016. Cycling (all cycling disciplines grouped) had the same number of medals in total, but 2 fewer gold. Having said that when you start from such a high base even being close is success – when other teams are videoing your warm up / stay warm routines it’s safe to assume you’re doing something right! 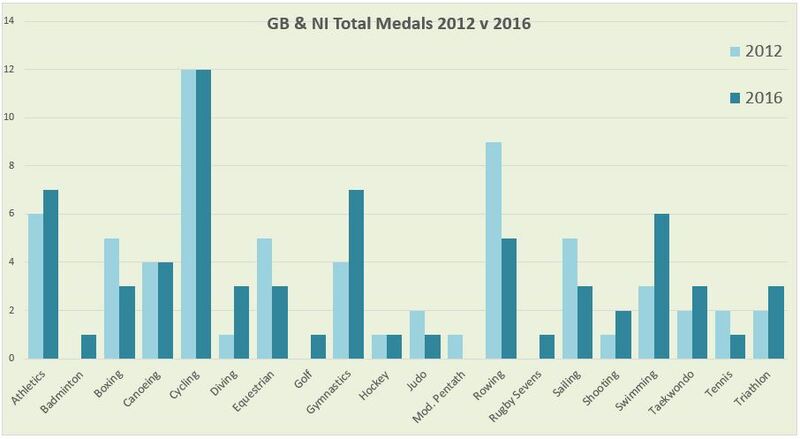 Last but not least, a column chart showing overall GB medals by discipline across the two games – if you need a binary sport by sport comparison rather than contribution to total the classics still tell it best. 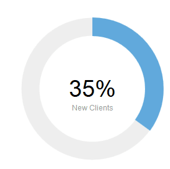 Tooltips can be a useful addition to reporting, often used to display additional context or information which you don’t want to have permanently visible in the main body of the report. 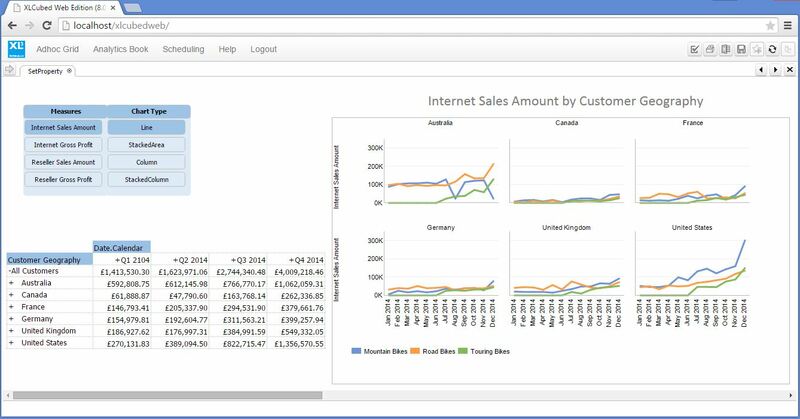 When the user sees a value of interest they simply hover over the cell and a popup displays the additional detail. The additional information can be anything required, as long as it can be retrieved from an Excel cell (or direct from the cube). Examples could include some textual information or sales for the same period last year. Implementing this in XLCubed reports is straightforward, albeit not immediately obvious. 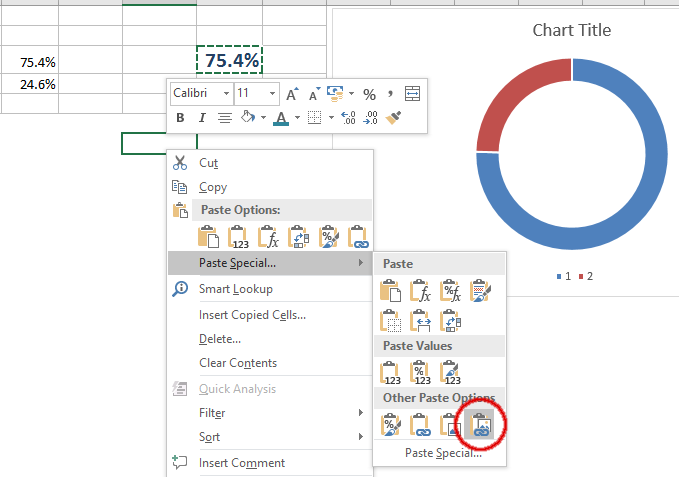 Tooltips are implemented using the XL3Link() formula, most commonly used for in-context navigation within a report, where the focus is moved from one sheet to another while passing a parameter. A special parameter, introduced in version 8.1, extends XL3Link() for tooltips as explained below. LinkLocation: where the focus would normally jump to on clicking the cell. This can be left blank if you just want a tooltip. 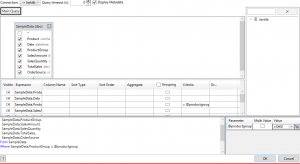 Friendlyname: what is displayed in the cell. 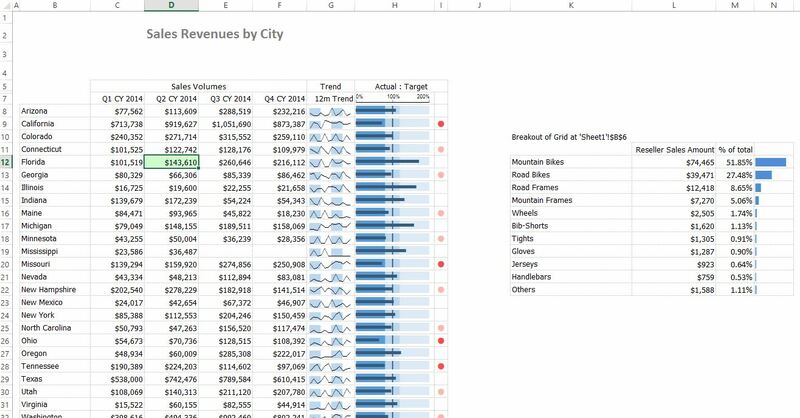 This could be static text (“i”) or an Excel formula referencing other cells in the workbook as needed. LinkType: can be left blank for Tooltips. To specify a tooltip, set Range1 to the value “XL3Tooltip”, and Value1 to be the content you want displayed in the tooltip. Value1 can be static text or can reference other cells as required, which means you can display other values which are also dynamically retrieved from the cube based on slicer selections etc. 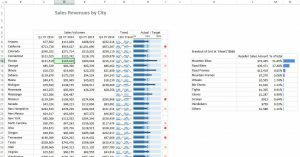 If the report is variable in length, the formula can be added into an XLCubed grid calculation and the Value1 parameter could use a vlookup to ensure a match on the appropriate data element. The simple example below shows the basic approach, and the result also works when published to XLCubed Web. The extended example below shows combining several additional data fields. The line breaks are achieved using Alt + Enter. The message which shone through was that what our customers value most about XLCubed is the flexibility. 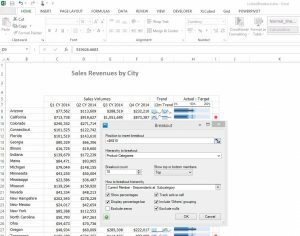 The mix of Excel itself extended with a focused BI client gives a degree of flexibility that other tools just don’t come close to. “There is always a way” was a phrase mentioned by several of the attendees, and great to hear from our perspective. We used part of the day as the first public preview of Version 9, and we were delighted by the feedback. 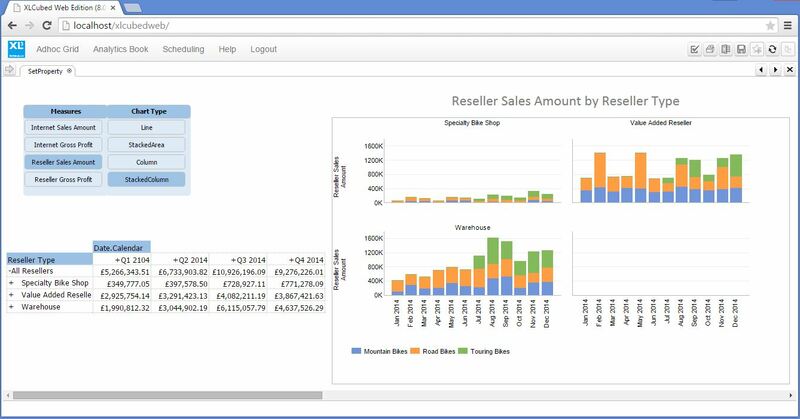 Extending the reach of the product to additional data sources like SQL, Power BI and Excel was extremely popular and the slick ‘panel view’ dashboards and responsive UI really resonated. We now ‘just’ need to finish development over the summer and look forward to bringing v9 to market! In displaying the key and often high level information required, many reports raise lots of additional questions in terms of why a specific number is ‘too high’ or ‘too low’, or how the number is comprised. 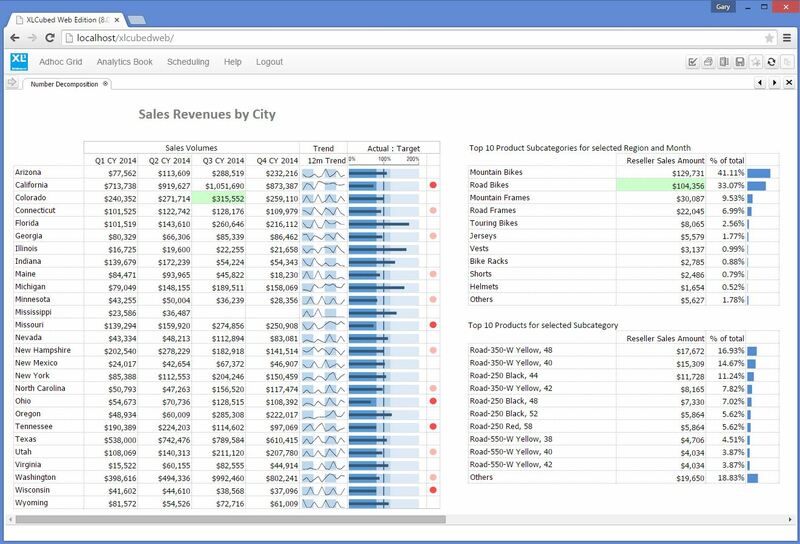 XLCubed provides lots of ways for power users to further explore and visualise this, but in this blog we’ll take a look at one of the simplest and easiest to implement within a report – a cell-linked decomposition view, or a dynamic breakout. 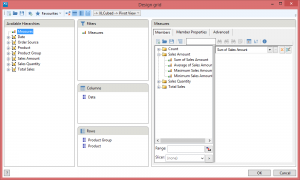 Select any of the values returned in the Grid and then either use the ‘Breakout’ option on the Grid Ribbon, or right click and choose XLCubed – Breakout Value. You now specify where to position the resulting breakout, which hierarchy to decompose the number by, at what level, and how many ranked items to show. In this example we’ve chosen the top 10 Products at the SubCategory level. The result is shown below. The green cell in the original grid is the cell the user has selected and is ‘tracked’, so when another cell in the grid is selected the breakout updates accordingly, meaning users can easily explore the makeup of their data. The breakout result can be further decomposed by running another breakout, this time on the product subcategory. In the published example below we’ve run an additional breakout showing the top ranked products in the selected subcategory. 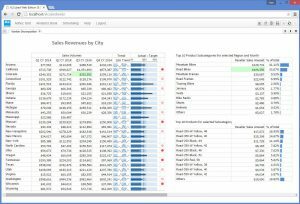 The report user can now simply click on the values which are of interest to see the associated product sales breakdown, and it’s something which can be built in minutes by the report designer. 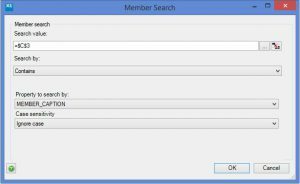 Finding a needle in a haystack – Member Searching made easy! 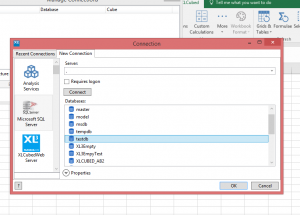 Searching for specific elements of large hierarchies can be a real pain in many Analysis Services client tools, and we often hear of it as a major frustration in Pivot Tables where dialogs can be cumbersome and prone to locking up. 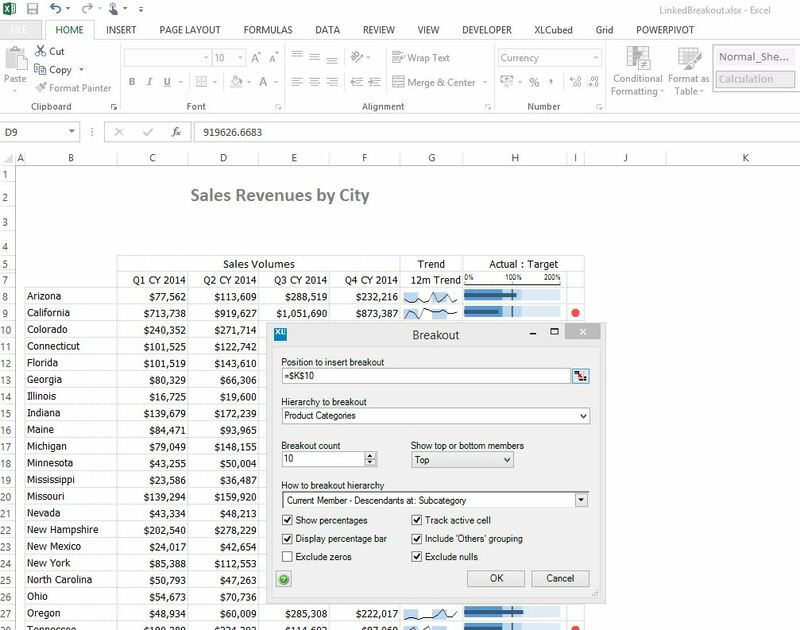 XLCubed has both a Quicksearch and an Advanced search in the Member Selector, but in this blog we’ll show how to link the search dynamically to an Excel cell (or a web entry cell on a published report) and to retain the search as a dynamic part of the report rather than a point in time selection. Below is the final result in Excel, a simple list-report where the user just types the text they want to search the hierarchy for, and matching products are shown on the rows of the report. We start with a regular grid, putting Product Categories on rows, and then in the Member Selector we can either select a specific level or set of data to be searched, or go to the Advanced tab and select the whole hierarchy as shown below. to add a search, and then in the dialog below you can either type a search term directly in the ‘Search Value’ or reference an Excel cell, in this case $C$3. ‘Search By’ allows you to specify exact match, begins, contains etc. 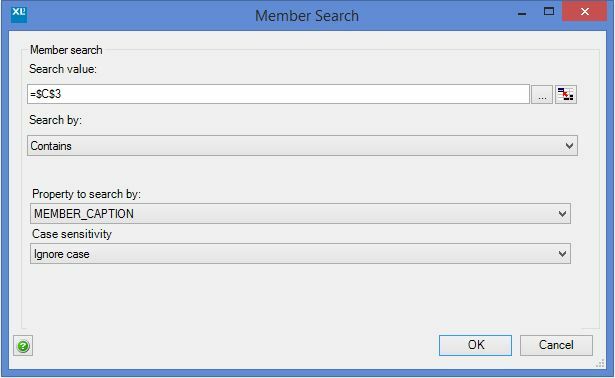 At this point it’s worth mentioning that while in this case we are just searching by the name of the product (MEMBER_CAPTION) we could also chose to search by any member properties which exist. So having done that we simply type the search string into $C$3 and we get the matching products straight away – couldn’t be easier. Make $C$3 available for web input. 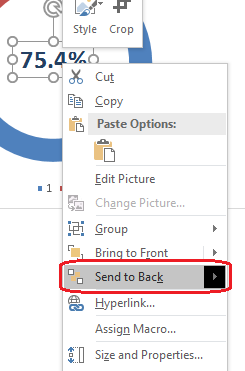 To do that right click on the cell and choose Format cells, and then on the protection tab uncheck ‘locked’. Add a search or refresh hyperlink or button so that the web user can refresh the report when they’ve typed the search term. This can be handled using either XL3Link() or XL3Picturelink and the process is described in our previous blog.